We looked at the weight of all of the saxophones we’re reviewed to date here at Saximus Maximus and thought we’d see how things have developed. In general we believe our featured horns are representative of the major brands on sale from the 1920s onward. The average weight of the 14 altos (including mouthpiece) we’ve reviewed to date was 4lb 5oz (2.19 kg). Surprisingly we didn’t discover significant differences between brand, so perhaps the idea that good quality saxophones are heavier is refuted by our comparison. We did discover differences over time which we put down to the continuous development of extra keys and features. Our result for the 1940s is skewed by only having one representative – ‘The Martin’. If we assume this is anomalously heavy, then there would be no weight drop in the 1950s. We’ll revisit this issue again once we’ve published a few more reviews. 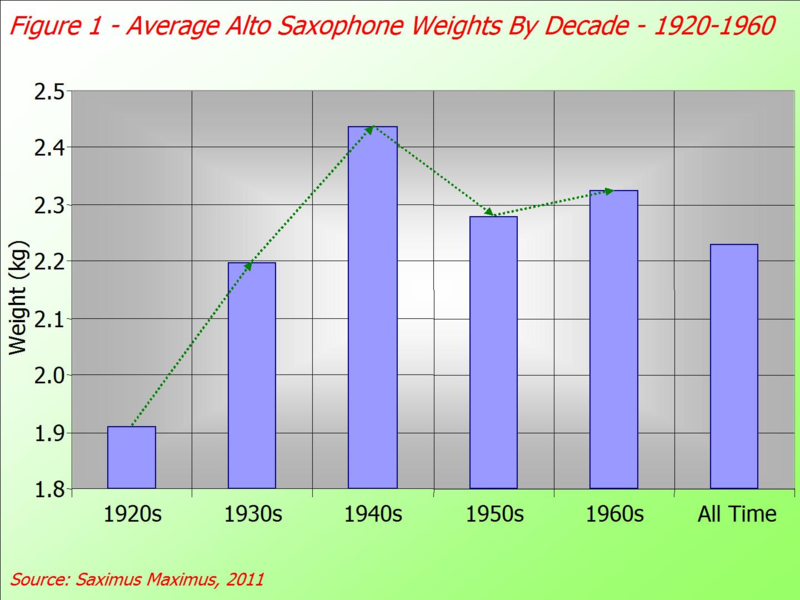 See Figure 1 for the development of alto weights over time. 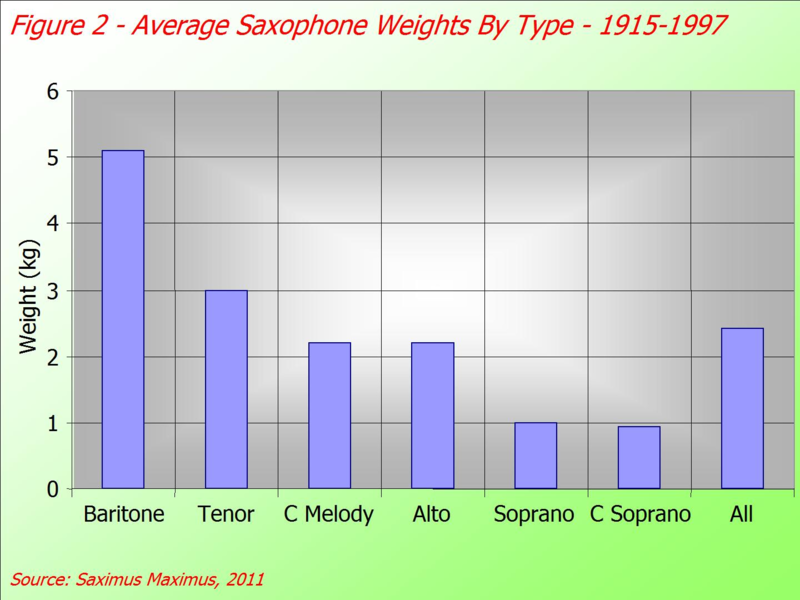 We also looked at the average weight of saxophones by type among those we’ve reviewed, with our results shown in Figure 2. There are interesting differences among the different makes and models – the Selmer Mark VI baritone comes out over 2lbs heavier than the Evette and Scaheffer for instance, but this is more due to the wide difference in manufacturing date (1970 v 1915) and the extra features (such as the low A) on the later instrument than it is to Selmer’s higher spec requirements. Undoubtedly there are lighter instruments available today, but our focus has been exclusively on vintage quality instruments. It’s not a surprising conclusion perhaps, but clearly we need to look at the development of saxophone features – from the addition of high F# and low A keys, as well as the movement of lower keys from left hand to right (through the period of ‘flappers’). So please hold on for a future post. If you have observations or requests for a look at specific issues please do so by commenting on this post. I really appreciate the trouble you have gone to to compile these fact which are most relevant to myself. I would like to reward you with some additional facts of the direction I am taking for saxophones. I am taking the integrated overview of the ultimate potential of the single reed/conical bore option, which should be playing the best music ever written not just superficial music. I found that, in spite of my vintage rod rubber Hite baritone sax mouthpiece being inferior to the extent that if an identical one were made for baritone sax in the design for the tenor it would be really much thicker especially the walls of the baffle area where the window is, and if the tenor was made in the design of the baritone sax it would be far to tinny in sound like lathing 25% of the wood of a top quality Buffet clarinet. so my dream sax is hydraulically drawn solid sterling silver in 0.8mm instead of 0.7mm in the Selmer Paris Super Action 80 Series III A64 design, and my mouthpiece is a replica made by myself, at David Hite’s suggestion back in 1994, when I phoned him personally to beg him to make me a sterling silver replica, which is miles better than the original, weighing in at around 205gm. I have no regard for the thin walled metal design, based on saving money for metal is stronger. So if we take the average tenor as 6lb 4oz (100 oz) and in 0.7mm and in cartridge brass, taking it that the Selmer design is within the average dimensions, the weight of my little beauty, taking it that the keys etc. account for say 16 oz, we now have a net weight of 84oz of cartridge brass and multiply by 0.8 and divide by 0.7=96oz and if we multiply by 10.36 the specific gravity of sterling silver and divide by 7.4 the same of cartridge brass we have = 134.4 oz plus the brass keys of 16oz=154oz = 9lb and 6 oz to the nearest ounce. The specific gravity of rubber is listed at 1.2g/cc and Bakelite between 1.3 and 1.4gm/cc so the range of possibility of rod rubber is between 1.2 and 1.4gm/cc the average being 1.3 so we will take that so divide my 205gm by 10.36 x 1.3 and a normal rod rubber mouthpiece most likely would weigh 25.7gm, but add the 205gm to the weight of the tenor sax =2.05 oz +9lb 6 ox =9lb 8.05oz.